The BendPak XPR-10S-LP offers exceptional direct-drive lifting performance with an important added benefit. The "LP" model offers all the same great features as their popular XPR-10S two post auto lifts, but also has low profile arms for fitting under low profile sports vehicles. 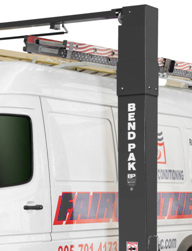 The BendPak XPR-10S-LP Lift is ALI and ETL Certified. The safe and rugged XPR‐10S‐LP two‐post lift features our exclusive Low‐Pro™ arms that accommodate lowered sports cars and those vehicles with exclusive lift points located on the extreme outer edges of the chassis. A telescoping overhead structure provides the convenience of wide or narrow installation wrapped up into one configurable package. This unique configurable design allows you to choose the best setting for your specific space or vehicle lifting requirements. The highly sophisticated yet simple and dependable XPR‐Series design requires very little service or maintenance for an overall lower cost of ownership. All BendPak's XPR two‐post models feature dual "direct‐drive" low‐pressure cylinders, maintenance‐free UHMW load bearings, single‐piece columns, extratall lifting carriages and triple‐telescoping arm configuration for increase arm positioning versatility. Double‐telescoping screw pads with gouge and tear resistant polyurethane pads to help increase workplace safety and reduce operating costs. A set of our 63mm stacking adapters are also included as standard accessories. 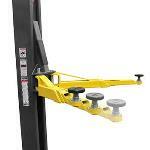 The XPR-10S is one of the best two post car lifts for sale on the market. It possesses all of the lastest features that you would want in a lift. But when some customers asked BendPak if they could add low profile arms to it, they decided to offer a separate model with low profile arms. That model is the new XPR-10S-LP is that model. So the pad height is not only 1/2 inch lower than the standard XPR-10S auto lift model at 3.5" so that they made the pads that grab the car frame any lower. But also, once you go past the pads, the arm structure is lower, thus allowing you to reach further under certain low clearance cars, without worrying about the arm hitting the frame before the pad gets to the vehicle's jacking point. What a great feature! The engineers at BendPak made the arms with rectangular steel tubing, instead of the standard square steel tube that is found on the regular model. Most customers won't need these low profile arms, but for those that do, it can add up to hours of productivity per year. No more toiling with arms, re-adjusting them to get at the automobile's frame jacking points. Note - Because the arms are low profile, they are only 2 stage arms, not 3 stage like the the XPR-10S. Bottom line - In this competitive business, you just saved yourself minutes of work per each car. That adds up over the course of the year. You know the old saying, time is money. Direct-Drive two-post car lift technology BendPak two-post lifts feature low-pressure HVLP direct-drive cylinders eliminating the need for lifting chains or screw mechanisms most commonly found on other lift designs. Dual HVLP low-pressure cylinders minimize leakage and offer better reliability, smoother operation and less maintenance costs throughout the life of your lift. High-volume, low-pressure equates to less workload placed on the entire hydraulic system. Direct-Drive technology is preferred on commercial-grade two post car lifts as it has it has fewer moving parts than a chain-over-roller cylinder configuration. Pressurized hydraulic fluid flows from the power-unit, through the hollow cylinder rods then enters the cylinder body and fills the inside cavity. The pressure of the hydraulic fluid extends the piston rod downward raising the cylinder body and lift carriages. A dual-synchro equalization system maintains equal lifting and provides operators with a stable, level vehicle working condition. Clearfloor convenience Our clearfloor models provide unobstructed floor space allowing technicians to easily move toolboxes, transmission jacks, oil drains and other equipment underneath the elevated vehicle. Triple-telescoping front arms and two-stage rear arms - (Not on LP Models) Increases overall arm positioning for lifting a variety of different wheel base vehicles. Overall arm sweep and minimum arm reach are also extended to precisely lift vehicles that have unibody construction, OEM recommended pick-up points and wide and / or narrow wheelbase configurations. 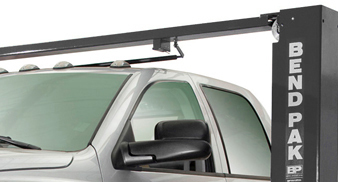 Optional column extension Gives you the flexibility of increasing the overhead clearance to maximize the vehicles you can service. Low-profile, dropped-end frame contact screw pads Squeeze under even the lowest compact and sport vehicles. Can be infinitely adjusted up to 2.5" for the ultimate in control and versatility. Included truck and van adapters Others might charge extra for these necessary adapters, but they're standard with every XPR-Series lift.  Ideal for trucks and vans with running boards or auxiliary fuel tanks. These extensions are 63mm. Automatic arm restraints Each arm is equipped with durable arm restraints that automatically engage each time the lift is raised. When the lift is lowered, the gear arm restraints automatically disengage to provide easy positioning of the lift arms. Taller lift carriages Take a close look at our lift carriages (the lifting assembly that the arms are attached to) and then take a look at the competition. You'll notice our 53" tall carriages are considerably taller than most, which minimizes the stress placed on the load bearings and columns. Maintenance-free load bearings Rather than using roller bearings that need to be constantly lubricated, every XPR-Series lift carriage uses high-tech UHMW (ultra-high molecular weight polyethylene) load bearings that never need lubrication and are designed to last the entire life of the lift. Single-piece columns - single-piece construction for added strength and less fatigue under heavy load conditions. Dual direct-drive technology By utilizing two, low-pressure HVLP direct-drive cylinders, we've eliminated the need for lifting chains or screw mechanisms most commonly found on other lift designs. HVLP direct-drive technology offers better reliability, smoother operation and less maintenance. High-volume, low-pressure equates to less workload placed on the entire hydraulic system. Single-point safety release The single point safety release and "dead man" style operation controls makes every one of our XPR-Series lifts easy to operate and safe to use.On the level Our dual-synchro equalization system maintains equal lifting and provides operators with a stable, level vehicle working condition. Auto shutoff A rigid, padded safety shutoff bar automatically stops the lift should a vehicle come in contact with overhead structure. Industrial-grade hydraulic cylinders Integrated into every XPR-Series hydraulic cylinder is a one-piece, pilot fitted, machined steel piston that is wrapped with specially designed, pressure loaded U-cup piston seals, backups and wear bands that virtually eliminate any fluid bypass. The micro-smooth chrome-rod is machined from high-yield, ground and polished C-1045/50 micro-alloy steel and plated to a minimum of .001" diametrically, to ensure superior cylinder operation and life. The superior-design high durometer, mechanically-loaded rod seals make rod leakage is a thing of the past while a specially formulated abrasion-resistant urethane rod wiper provides exclusion protection. The welded cylinder body is made from robust steel tubing produced to exceed ASTM specifications. This combination of superb base material and superior processing ensures that the cylinders remain straight, smooth and last a very long time. High-speed hydraulics Free-flow, high-pressure 3/8" hydraulic lines, a high-flow pump and integrated AC power-unit increase ascent and descent speed rates for enhanced productivity. Durable powder-coat finish All XPR-Series lifts feature a durable powder-coat finish that gives the metal a high-quality, extremely durable finish which can withstand even the harshest environmental or chemical conditions. Unlike other companies that claim to powder coat, we take pride in our meticulous 10-step process. First, all parts are visually inspected before being sandblasted. Afterwards, the parts are washed in our 5-stage phosphate tanks that can accommodate parts up to 25' long. Once cleaned, they're immediately dried to avoid rust production, and then outgassed. Outgassing pre-bakes the parts in a curing oven, reducing the possibility of blemishes that may be hiding in the pores of the metal. If not properly outgassed, imperfections in the metal may bubble during the curing process and most likely will cause chips in the powder. After the parts are washed and outgassed, any surfaces and / or threaded holes that need to be masked or plugged, are done so with high-temperature masking tape and silicone plugs. Next, the parts are given a quick thinner wipe to remove any light debris or fingerprints, before being hung on an electrostatically grounded conveyor line. The powder is finally applied using an electrostatic spray gun. The powder "sticks" to the surface in a fashion similar to how dust sticks to a television screen. Once the parts are powder coated, the carts are rolled into our curing oven and baked at 400° F for 45 minutes.